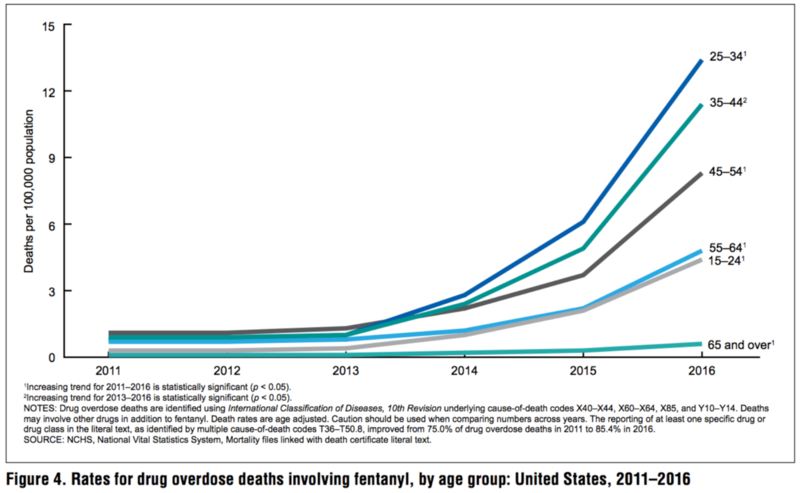 Between 2011 and 2016, fentanyl overdose deaths increased by more than 1,000 percent. 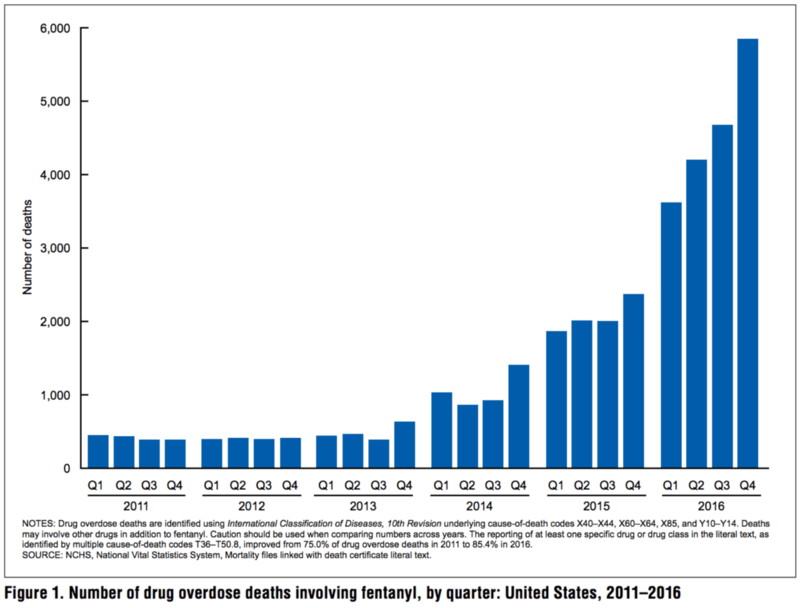 In 2011, for example, there were about 1,660 Americans who died of fentanyl overdoses. Fast-forward to 2016,when there were 18,335 Americans who died from fentanyl. The opioid crisis, though, is not impacting all states and demographic groups in the country equally, the CDC report finds. 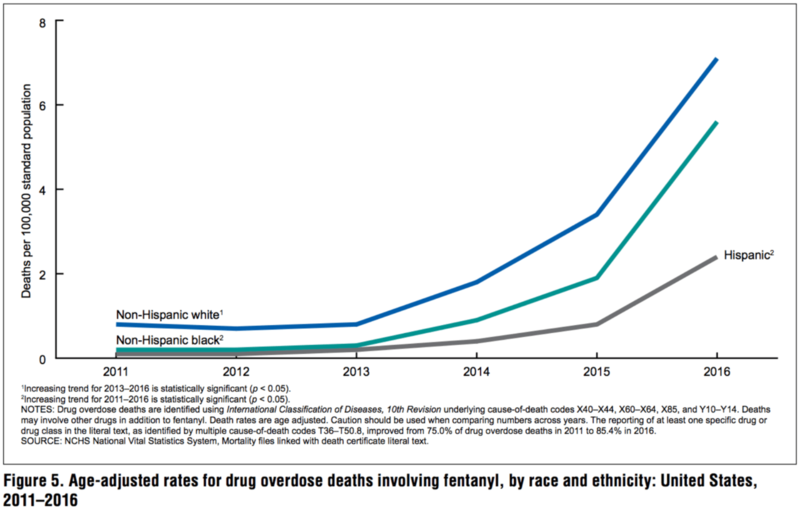 White Americans have a significantly higher rate of dying from fentanyl than any other racial group in the U.S. For instance, non-Hispanic whites’ rate of fentanyl overdose deaths increased n early 110 percent between 2013 and 2016. In 2016, close to eight out of every 100,000 non-Hispanic whites died of fentanyl overdoses — more than three times the rate of Hispanic Americans dying from fentanyl. Black Americans followed whites, with a rate of about 5.6 deaths for every 100,000, followed by 2.5 Hispanic Americans who died from fentanyl for every 100,000. American men are dying from fentanyl at nearly three times the rate of American women. In 2016, there were almost nine men who died of fentanyl for every 100,000. Compare that to the roughly three women who died of fentanyl for every 100,000 women. For young people, the opioid crisis is even worse. The CDC finds that between 2011 and 2016, the number of fentanyl overdose deaths for Americans aged 25-years-old to 34-years-old increased 100 percent every year. For Americans aged 15 to 24-years-old, the number of fentanyl overdose deaths increased almost 94 percent every year between 2011 and 2016. Out of every 100,000 young Americans in 2016, there were 13.4 who died of fentanyl overdoses. For every 100,000 Americans aged 34 to 44-years-old, there 11.4 who died of fentanyl overdoses. In the most northeast states of the country, the number of Americans dying from fentanyl overdoses increased almost 114 percent every year between 2011 and 2016. In the New Jersey and New York area, fentanyl deaths increased 111 percent every year over the last six years, and in the Delaware-D.C.-Maryland-Pennsylvania-Virginia-West Virginia region, fentanyl deaths increased about 104 percent every year. The American Midwest saw a 102 percent increase every year between 2011 and 2016 of fentanyl overdose deaths. Last year, the Immigration and Customs Enforcement (ICE) agency seized enough fentanyl to kill nearly twice the U.S. population, Breitbart News reported, and for the first time, Americans are now more likely to die from an accidental opioid overdose than from injuries in a car crash. 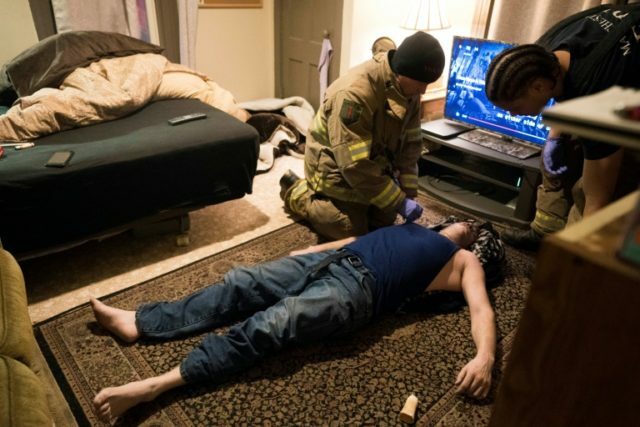 Drug overdoses in 2017 killed an unprecedented 72,287 U.S. residents, nearly three times the number of individuals killed by global terrorism and 10,000 more than the number of Americans killed in the Vietnam War. Nearly 50,000 of those deadly overdoses were caused by either heroin or fentanyl.